Her sensitive work, full of startling images, draws us into an almost surreal, private place where “secrets hide like butterflies in moonlight.” Her thoughtfulness and relentless tenderness offers up “a cup of something” for poets and non-poets, lovers of the word and the world. Lynn Ciesielski's muse bids her to write, to seek “Secrets [which] hide like butterflies in moonlight.” She is keenly aware of the elusiveness and fragility of those secrets as she seeks them in a variety of places-in the old and decaying, in childhood memories, in family traditions, in the mysteries of love, in quirky characters; and she does so in a dazzling array of verse forms. She recognizes a certain danger, as in one who “traveled, saw a lot/and understood....too much, I think”; but though she cannot quite find “a sacred link,” she carries on with gritty courage in a sacred language of her own. creamy cheese, from a bowl on the table, then licks. from the Market on Broadway just after it opened. eye level with flowered housedress waists. in an aluminum bowl, cuts butter in with fingers. sour cream, kneads till it's a soft pillow. fills each with cheesy mix, folds, seals. they prayed each night on crystal rosaries. bringing little but themselves and what they knew. like I will in years to come. 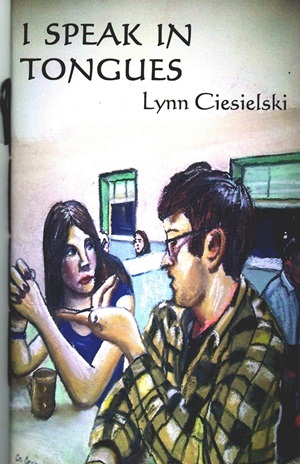 Lynn Ciesielski has a Master's Degree in Exceptional Education from SUNY College at Buffalo. She spent eighteen years teaching full time in city schools. For another five years she worked part time as an instructional aide in group homes for disabled adults. Currently, she is retired and focuses most of her energy on her poetry. Lynn is a newlywed, the mother of a lovely grown daughter and grandmother to two delightful little boys. She loves the outdoors, especially waterfalls and oceans. She travels as often as she can but Lynn loves people even more than the physical world. Family and friends are the most delightful aspects of her life.